I'm very big on participating in hackathons when I can spare the time. I really enjoy hackathons because it's avenue for me to interact with some extremely talented individuals who for the most part have the same passion for technology as I. 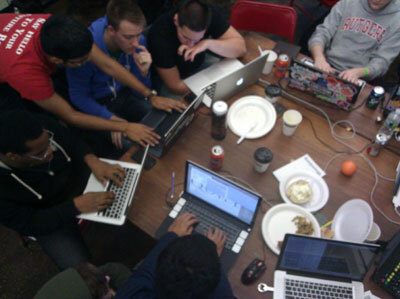 These hackers attend hackathons to ultimately built things. Whether it be software or a hybrid software/hardware automation project these individuals pour their passion of technology into their project which by the way must be completed under extreme time constraints. Hackathons usually run 24-36 hours but I've actually participated in competitions that lasted 8 hours & I am still in awe of the creative and well designed solutions that are produced at these events. Ok so now that I've given my props to all my hackers the true purpose of this blog is to share my Hack'nJill Hacksgiving experience. Hacksgiving was hosted at the gracious Etsy offices in DUMBO district of Brooklyn, NY. The venue definitely handled the capacity very well. During the opening and judging events I counted over 200 people in the space. An excellent space for the event. The Hack'N Jill event organizers did great job introducing themselves, the sponsors and basically giving the crowd the required event intell. The sponsors all gave their super quick pitches on their APIs and OpenShift pitched the free Platform as a Service (PaaS) offering that the hackers could use to host their projects. After all the sponsor pitches the hackers were given 60 seconds to pitch some project ideas. They all pitched great ideas that mainly addressed communication deficiencies during emergency/disaster scenarios such as the recent comm short comings exposed by Sandy. It was great to see the community pitch in and address some of these issues but then again hackers are always civically minded and ready to help when & where needed. I have to say that the organizers were very prepared to satisfy the hackers' appetite with great selections of food, beer & wine. I mean stock piles of the stuff and I got to even try a beer I've never had before. The opening ceremonies concluded and the hackers swiftly grabbed as much pizza & beer as they could carry and we were off to the overnight venue to start on hacking projects. Since I was there to support the hackers in using OpenShift we joined the crew at the overnight. Right off the bat three teams had decided to use OpenShift so we quickly got them up and running on the PaaS. After 2 hours I was beat and hobbled off to the hotel for a few hours of sleep. At 8:00 am we returned to the Etsy office and we were greeted at the front door by a group of hackers and crates of bagels & cream cheese. The room quickly filled surprisingly with the lady hackers first which left me curious as to where all male hackers were. One minute later the overnight crew showed up and it was on. Hacking was in full effect. The collaboration was thick, teammates conversing and coding with such passion & competitiveness all the while having a visibly great time and enjoying every minute of it. A great lunch was served and we quickly devoured these delicious gourmet sandwiches that you could only really get in NYC. I had a chicken salad sandwich that had halved grapes and other spices I couldn't identify but it was fantastic even though I was initially dubious of the grape bits. 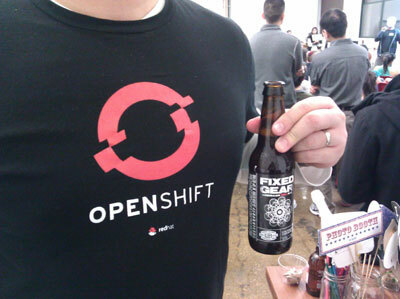 After lunch some teams were ready to start testing and deploying their apps to OpenShift and that's when we got busy. Three quarters of the way through the event an announcement was made that fresh gourmet ice cream was being served. I was busy assisting some teams but I did look up and see a woman actually serving hackers ice cream from a proper ice cream cart that even had an umbrella. I will admit this was a hackathon first for me and it was an awesome idea that I hope to see in future hackathons. About four hours out from the hacking deadline I was sitting next to a designer named Alexandra and I asked her if she wanted to work on a hack with me. She was already working with another team but she had some downtime and gladly accepted my offer. I quickly explained my idea and she began designing the front-end to our app. I was coding the backend and cleaning up some OSHA data that we were going to use. I had been sitting on this public OSHA dataset that contains all of the reported workplace fatalities since 2001. It seemed a bit morbid but the intention was primarily to bring awareness to the existence of this publicly available data produced by the federal government. During the last hour of the competition teams were hopped up and buzzing. Everyone was in a mad rush to put the finishing touched on their projects. We even felt the pressure of finishing but we recovered from a few stumbles and produced a very simple but functioning app. The competition deadline arrived and all the hackers were told to cease development and ushered into another room for the wonderful Mexicue that was being served. Again another great meal devised by the Hack'N Jill team. Dinner passed and it was time for the judging. The room was filled with more folks than were present for the actual hacking. The teams did a great job presenting their projects and answering the judges' questions. In between team presentation setups one of the HnJ hosts would tell the worst jokes. She was cute on delivery but I have to admit that these joke were horrible. She knew they were bad but she still tortured us with them. Alexandra gave our pitch for our app Fatal Query & I have to say that though our app very basic it showed something quite unique & very different from all of the other projects being pitched that night. I quickly noticed the room's curiosity for the app. Alexandra was querying the app and showing the number of deaths that occurred in 2012. It definitely got people's attention. The pitches concluded and the prizes were awarded. The judges definitely had to make some tough calls. There were many projects deserving of 1st place but in the end they chose and in my opinion it was an appropriate selection. The winning app was Disaster Remote Response by @harisamin & @maggit. Congratulations to you both!!!! You can take a look at event details on the Hacksgiving Hacker League page. I first want to say that I was impressed with the amount of volunteers that were working the event and I'm definitely giving them BIG props for their role. You hackers all know how filthy we can get and these folks were cleaning up after us like nobody's business. They really expended a ton of effort in making us comfortable and I for one really appreciated that so thank you to all of the volunteers. In my humble opinion the Hack'N Jill Hacksgiving event was to date the best hackathon I've ever attended. There were plenty of talented hackers, great food, drink, interesting people but most of all really really really bad jokes. The ladies of HnJ put on an excellent event and I will attribute most of their success to their creative approach and attention to details. The HnJ model should be the standard template for all future hackathons everywhere with the exception that they invest in a dirty joke book and tell some of those jokes at the next event. Looking forward to the next one! interact with instances of IBM's FileNet P8 and installing FileNet was an utter nightmare. Throughout the years I have encountered & used IBM solutions and systems in many capacities but I can honestly say this was the worst experience I ever had with an IBM solution. The project has a really tight deadline and my time to hack a solution was very short. Upon procuring the FileNet software I first had to spend about 2 hours on the IBM Passport site which is where I had to hunt down all 11 install packages that clock in at over 10 GB compressed. The IBM Passport site is not user friendly at all you'll probably spend a few minutes figuring out how to find the packages that you need. I just ran searches in the "Find By" name for each install package. Be sure to download the proper packages for your particular OS. So it's been kinda fun watching people freak out about the Heartbleed vulnerability this week. What I don't find so funny & kinda scary is that this vulnerability has been in the wild since December 2011 and people are learning about this over two years later. So people please patch your servers and take other measures as recommended per your distro's security bulltetins. doesn't have systemV or systemD scripts which allow the service to autostart as a daemon on the host OS. I asked about these scripts in the Confluent Community slack channel & a member politely responded that these daemon scripts will be available in Confluent Version 4.1 & at the moment I would have to roll my own. I have created a very simple Confluent systemV script that has been tested & works on AWS Linux. Important: This script is designed for a a Single Node/Sandbox installation of Confluent and should not be used in Production deployments. I'll follow-up with another blog that'll address all of the Confluent services in individual systemV scripts which can be used in distributed deployments.